After a quick morning workout, I decided to meet up with Brian for a relaxing, reggae-themed bowl in Toshima-ku at Rahmen Yahman. Ever since Nate checked out this place a few months ago, we've both been yearning for an irie bowl of shoyu ramen. The interior is awesome. But be sure to look out for all the secret menu items hidden in obscure locations. The shoyu rahmen was really good. 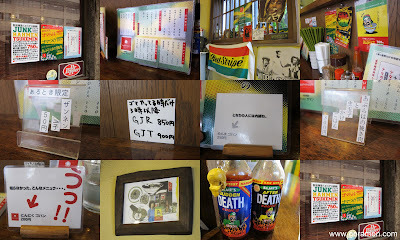 But like how the concept of the shop was unique, I was looking for something more rastafari. The noodles were fantastic, but the soup reminded me of Jiraigen's. If you know what I think of Jiraigen's shoyu ramen, then you'll know what I thought of Yahman's. The menma gohan was one of those secret menu items that I found listed on the back of the menu stand. Brian got the kakuni gohan as part of his lunch set. He thought it was alright. Afterwards, it was off to Koenji to meet my friend moca for dinner. I was a bit early so as I walked from Asagaya to Koenji I spotted this mega sized curry for only 400 yen (~$4.50). Dang that's cheap! Too bad I was on my way to a vegan dinner. Yup, somehow I was convinced into eating a vegan meal at a place called Vege Shokudo. So for all you readers out there worried about my eating habits, I'm eating vegetables!! haha. The set menu was only 750 yen and it consisted of many ingredients that hardly ever make it into my body. But it was actually quite good. Perhaps I should do a meal like this between bowls of ramen everyday. After dinner, instead of heading to the nearest bar to drown ourselves in liquor (we would never do such a thing), moca wanted something sweet so we found an old school dessert shop where we ordered this shave ice topped with green tea and red beans. And this Shiratama Cream Anmitsu. A sweet ending to a relaxing day. Believe it or not, no alcohol was consumed on this day off. haha. what was that pink foamy stuff @ the vegan place?